So you have a chanter reed that is too hard and you are a nut who likes to play with hardware and mechanical stuff and the thought of making a chanter reed break-in device gets you psyched, this article is for you. First off, why break in a reed artificially? So what does mechanical break-in get you? A reed with a lot of cane but is easier to play and, if done correctly, a bit more humidified too. On the other hand, it takes purchasing some hardware and some assembly . . . and possibly tolerating some noise. I broke in a chanter reed in 2007 using a compressor and a relatively simple contraption. This homemade cap shows a securing nut but it is unnecessary. • airbrush hoseabout 3/32" (2.3mm) inner diameter, designed for typical use of under 50 PSI. To make the chanter cap, the PVC pipe I used had a 13/16" (20mm) inner diameter and a 1-1/6" (27mm) exterior diameter. I drilled a hole in the plastic end cap to fit a male/male metal fitting to attach to the air line. 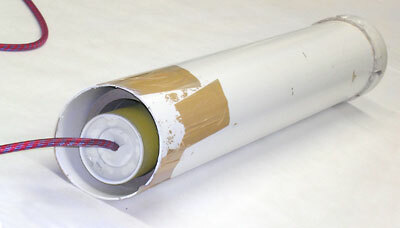 The chanter is hemped and wrapped with Teflon tape for an airtight fit with the cap. The cap doesn't really need a locking nut since the fit should be very snug; in my case, I'd made the cap previously to use as a typical true chanter cap, hence it already had the plastic nut. I wiped the exposed blades of the reed liberally with water using my finger, let it sit for about 10 seconds, then wiped off any standing moisture. I installed the reed in the chanter and put on the cap. I hooked up all the hoses then gradually increased the regulator pressure from zero up to the point where the reed kicked in a High-A, then I dropped the pressure to just above reed cut-out. (Some experimentation was required to determine the lowest possible setting on the regulator for this.) I found that if I left the reed sounding at the higher pressure, not too much later it closed up and stopped sounding. If I dropped the pressure, the reed would sound indefinitely. The regulator with quick-release connections. The 120 PSI compressor line is on the left, the airbrush hose is on the right. I had turned off the compressor after the tank (about 50 gallons/190 liters) was full, so I just let this contraption run until the tank drained. I did this at work after closing and just let it do its thing. With this set-up the tank emptied in about an hour . . . equal to some piobaireachd practice. I did this a couple days in a row and it greatly helped the reed ease up. 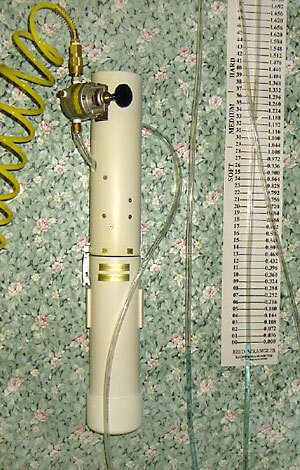 Ideally, you'd want to tape the chanter to play different notes for each treatmentsuch as High-A, D, Low-A, etc. You don't want to let the reed run more than a person would typically practice, in other words, don't get impatient and run the reed overnight. I tried that once and the reed closed up and was unplayable. The reed was able to be a least somewhat resurrected by coaxing the blades back open by pinching the sides for weeks with a spring-loaded clipI still have the reed, it recovered and is functional after its grueling all-night torture test. That said, don't count on an overplayed reed surviving. Oh, and being that I didn't want anyone to think that a burglar alarm was going off at work, I put the chanter in a tube—the airbrush hose run through a slit cut in the plastic cap—with padding around the sole end and loose balled up paper at the open end of the tube. Then I put that in a larger open tube, followed by another tube with one end sealed. All this to just dampen the sound some. You don't want to put it in a completely sealed tube or the back pressure will cause the reed to shut off. Here you can see how I've significantly cut down on the sound coming from the chanter by baffling it in some tubes. 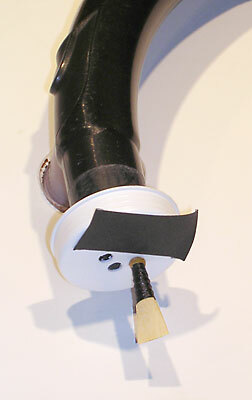 A practice chanter (with a pipe chanter reed seated) secured to a small compressor via some plastic tubing. 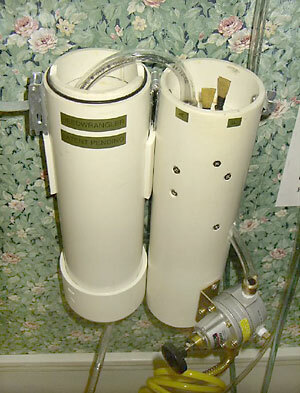 Pressure is controlled by allowing most of the air escape from the tubing. A really simple method of breaking in reeds is to get a practice chanter, put your new pipe chanter reed in it and very loosely tape the mouthpiece to a raw compressor hose. You'll want to allow some of the air to escape otherwise the reed will be overpowered and simply close up and stop working. Alternatively, you can get a thin plastic pipe or vinyl tubing, drill some holes in it and connect one end to the mouthpiece and the other to the compressor. Then you'll tape over some holes as needed to increase the pressure in the air line to the reed. 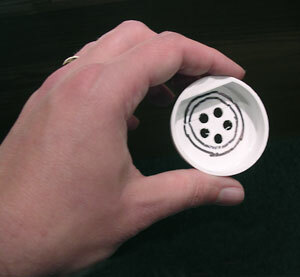 The holes act as a very rudimentary bleeder valve allowing air to escape and dropping the air line pressure. Some small compressors put out inconsistent air pressure (often those compressors without tanks), so if you find this system doesn't work it may be an impossible configuration for your particular compressor. Now, some people have successfully used household vacuum cleaners to break-in new reeds. Then again, some people have successfully used new reeds to break household vacuum cleaners. (I've heard the stories!) If you have a vacuum that you don't mind possibly destroying, you can place a customized plastic cap over the hose of the vacuum. The cap should have a number of holes drilled in it, one to seat the reed into and the others to control the pressure. You turn on the vacuum and air is sucked through the reed and the holes into the hose. The reed may not sound if too much air is going through the auxiliary holes; in that instance you'll want to cover hole after hole with tape until the reed sounds, then once the reed is sounding try to uncover one of the holes a little to back off the pressure on the reed a bit while keeping it sounding. (You can get a good idea of the taping requirements by simply blocking the holes with your fingers while the reed is sounding.) You won't want to run the reed more than about 20 minutes at a time and you'll want to keep a very close eyeand earon the vacuum. A fire extinguisher and a bouquet of flowers for your wife might not be a bad idea either, just in case. 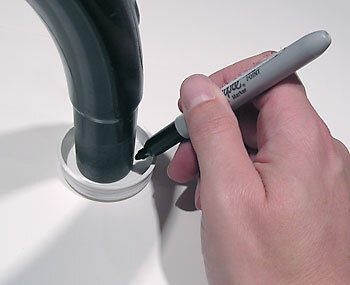 Marking the circumference of end of the vacuum hose on a plastic mailing tube cap. The vacuum hoses that I've seen are pretty standardized with a 1-3/16" (30mm) outside dimension and a 15/16" (24mm) inside dimension. After also marking the approximate inside area of the vacuum hose, I drilled five 5/64" (8mm) holes to fit the chanter reed and help control air flow. After propping up the hose and turning on the vacuum, the plastic cap is placed over the end of the hose. For this already easy reed, two holes were covered with tape for proper sounding of the reed; for others, it might be more. Of course, the more holes you cover the more unhappy your vacuum will be! Far more complex devices can be exemplified by the two following solutions. This is quite an elaborate solution by Gary Gifford, which was at one time intended to become a commercial product. (This one didn't meet success, but a number of Gary's other ideas did. You can find Gary's products at ReedWrangler.net.) 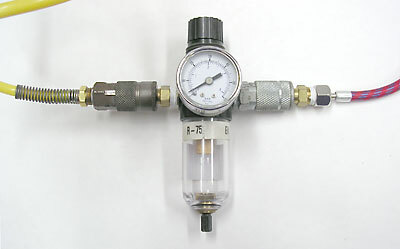 Compressed air enters the unit through a precision regulator and into a reservoir of hot water at which point the air escapes through a perforated hose. The air then passes through the reed (or reeds) into the top of the unit then to a water manometer hose which provides ongoing visual feedback as to the hardness of the reeds. A complete and detailed description can be found in Gary's Provisional Patent Application (PDF, 736K) for the "Bagpipe Chanter Reed Blowing In Machine." a.k.a. The Reed Wranger. The following device was contrived by Ronald Zissell with the original intent of testing new chanter reeds for his clients in a sanitary fashion but could also be used to break-in new reeds. Air from a compressor (60 PSI) enters at left (orange hose) and passes through a regulator (pressure gauge 0-100 PSI) which drops the pressure to 3 PSI. A shutoff valve follows and another pressure gauge (0 - 3 PSI), then a large regulator with calibrated knob on top that adjusts the final pressure. The air exits the regulator and proceeds to a "T" splitter in the line. Air goes to a large tank (which helps stabilize the pressure) as well as into a glass jar (seen on the back right) where it bubbles through water to humidify the air. Air continues to the second jar (left) which is empty and collects the drops of water that would otherwise appear at the chanter. The moisture helps soften the reed and prevent splitting. A hose then brings the air to a chanter cap with a final pressure gauge (0-3 PSI). The small screw with the knurled head seen below the wood chanter stock is a bleeder valve which can adjust the reed presure more finely than the regulators. Mr. Zissell added the bleeder valve after he found that the regulators can control pressure at constant air volume but not over a wide range of air volume changes. The low and high notes of the chanter take significantly differing volumes of air. The bleeder valve allows for quick fine adjustments of the air pressure at those different air volumes. After all the above, keep in mind that mechanical reed break-in is the rare exception, though it can be very effective. It's far more common for pipers to simply sand or scape or blow-in their reeds and most will be entirely happy sticking with that process, after all, it is a lot less set-up work. If you opt to try artifically breaking in a reed, don't be surprised if you get more than a few eyebrows raised in skepticism! You may also be interested an objective and accurate means of measuring the pressure required to sound your chanter reed. 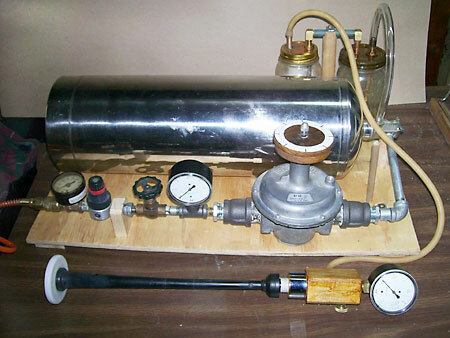 My article How to Build a Water Manometer describes such a device. If you have comments or suggestions about this page, please contact me. This page last updated Tuesday, May 24, 2011. Page first created in September 28, 2009.